Ideal for well-defined all-day tumbling curls, this curling iron is everything that you need. It helps the hair retain its natural moisture and leaves your hair looking shiny and smooth. 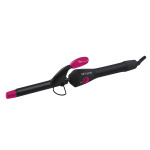 The rubberised grip makes it comfortable to handle and the fast heat-up helps to reduce the styling time.